He is Kutch district President of ruling Bharatiya Janata Party. He is MLA too and has been associated with number of local institutions involved in services. But when it comes to goddess of Kutch Ashapura devi mandir, he feels he is just an ordinary devotee.He is Shri Jayantibhai Bhanushali. Bhanushali had prayed at Mata no madh mandir of goddess Ashapura for normal rain in Kutch this season. When he prayed, the situation of monsoon was grim. However now when Kutch has received more than normal rain in this season of monsoon, Bhanushali is going to thank the goddess in unique way. On Monday, 3rd October, Bhanushali will start crawling or rolling on the road between the gate of Mata na madh mandir to the mandir itself. Bhanushali describes this as the holy place of fulfillment. In Navratri days crowds of thousands of devotees walk on their way to Ashapura mandir. Religious fervour is at its peak on 8th day of Navratri as padyatris began to foot it out. Some carry colorful buntings and banners, some push along a model of the shrine fixed on a wheel barrow which they call rath with loudspeaker blaring bhajans. Some devotees forming a mandal could be seen dancing on the road to the rhythm of manjira (cymbals) and dhols while others trudge along shouting jai mataji often expecting others on the road or in vehicles to respond. Thousands could be seen barefooted. Many would refuse to eat anything until they offer their prayers to the goddess. To witness Bhanushali rolling on ground, several local leaders are going to remain present. 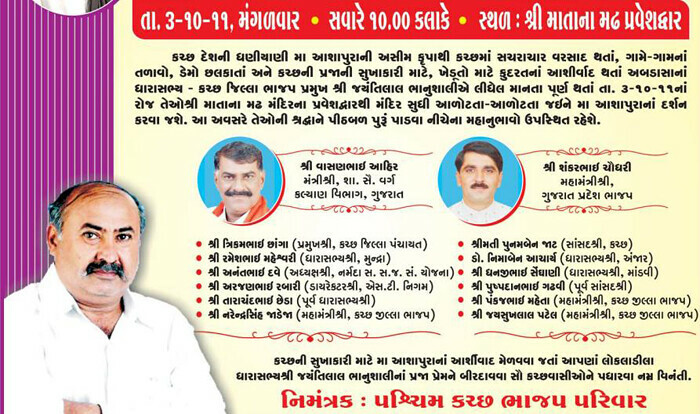 The list includes minister of state Shri Vasanbhai Ahir, state BJP General Secretary Shri Shankarbhai Chaudhary, district panchayat president Shri Trikambhai Chhanga, Mundra MLA Rameshbhai Maheshwari, Director ST corporation Shri Arjanbhai Rabari, former MLA Tarachand Chheda, General Secretary of Kutch BJP Shri Narendrasinh jadeja, member of parliament smt Poonamben Jat, Anjar MLA Dr Nimaben Acharya, Mandvi MLA Shri Dhanjibhai Sendhani, former MP Shri Pushpadan Gadhvi, General Secretary of Kutch BJP Shri Pankajbhai Maheta and Jaysukhlal Patel among others. Bhanushali lost his son last year in an accident. After son’s sudden death, Bhanushali has focused on service. He helps Kutchhi patients admitted in Ahmedabad’s Civil and VS hospitals and also does lots of other charitable works like cattle camps, health camps, distribution of musical instruments during Navratri, facilitation of Hajis returned from Hajj among others.